I admit, I am a tanning addict. I love to be bronze all year long. I am quite loyal to my Garnier summer body but often experiment with other brands. What is says on the product: This super fine self tanning spray delivers the ultra even, ultra smooth all over tan you've always wanted. Infused with conditioning aloe vera and long lasting colour. You'll have a perfectly natural looking tan in an instant. our innovative fragrance technology helps to take away the tell tale tanning aroma to make way for a beautiful subtle, yet refreshing fragrance. Directions: Exfoliate, moisturise dry areas, hold can roughly 6" away from skin and spray all over, blend in if needed, wait until touch dry to get dressed, do not sweat or get wet for at lest 4 hours, finally shower to reveal your golden tan. What do I think? At first I was unsure if this product delivered an instant tan or one that developed over the hours. I have come to the conclusion that it does both. The tan that develops over the hours is tinted on application, but not as obvious as their mousse formula. However, I put a white towel down on the floor whilst applying but there was no residue on it. weird? There must be some kind of chemicals that only activate on the skin?! ADVANTAGES: I followed almost all directions (I didn't blend in, I didn't think it was necessary) and within a few hours I looked like I had just returned from an exotic holiday. The colour result was a lovely golden bronze, that looked even and natural. Yes, there are a lot of products that deliver this result, but the thing that separates this from the rest for me is the application. I mean, my hands and feet are the same colour, no streaks or tell tell lines and I didn't have to blend anything in or wash my hands. The aerosol spray can makes application quick, and fuss free. Furthermore, this formula didn't break me out, I have had severe breakouts with the St Tropez everyday gradual face tan and was actually really scared to use this but thankfully, it's OK - Phew! Also, I don't stink :) I actually smell quite fresh. I have come to the conclusion that "spray" packaging is "my" thing, hence the reason I love my garnier summer body spray tan so much. DISADVANTAGES: I did cough quite a bit as the fumes and initial scent get a bit much in a small room, make sure you have a window or a door open whilst applying. There was a tiny bit of transfer onto my pj's so I would recommend wearing dark clothing if applying before bed. Would I buy this again? Yes, but I wouldn't use it all the time, purely because it retails for approx £20, I would save it for special occasions. Have you tried this? If so, what do you think? I was sent quite a few products from St Tropez and this was the only product that stood out for me. Also, are there any other "spray" tanning products out there that you recommend? Excellent review! I have been using the moose for a while, but I have almost ran out. But Ive also stopped for a while as I am close to my due date! The spray looks gorgeous! How often would you apply this so it doesn't go patchy? I need this in my life! lol im too white right now!! 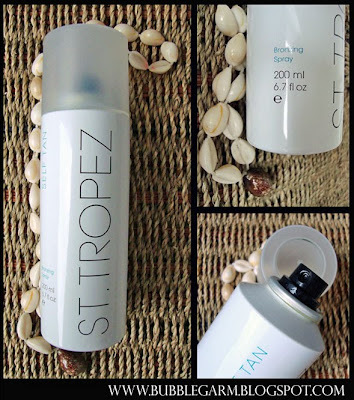 Would you say the St. Tropez spray is better than St. Moriz? I am a fake tan addict myself and I can't stop buying anything you I liked St Tropez But..the Price is just to hight for me for it to be my HG !!!!! I love this product but I got fed up having to buy it every other week coz the bottle runs out so quick!!! @Marshall i've never tried fake bake.. one to put on the list! @Hollywood yes, the price is too much, my hg is the garnier summer body spray, love it! but this is better, as one application gives me an intense colour where the garnier i have to use twice. ive tried a few fake tanning products Garnier Ambre Solaire Dry Body Mist (the light one and the regular one), l'oreal Nutrisummer Lotion, and Skin wear spray tan... but ive never tried St Tropez although i am always tempted to try it when ever i see it at the department store, i cant decied between the bronzing spray or the everyday airbrush. I just bought more of my favorite self tanner today! I wish we had the garnier...ever since you told me it smelled like pancakes so long ago I have been wanting it ever since! 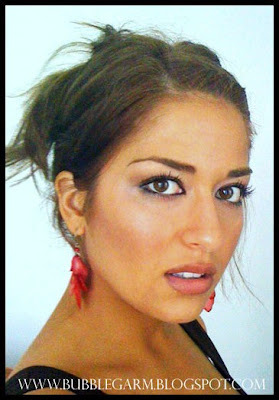 lol You look great in your pics..I love st. tropez! this fake tan is amazing :) i love how it doesnt streak at all.. and it leaves a nice brown/bronze natural tan!